Our exceptional, friendly staff is our greatest asset. They are excited about what they do, and they care personally about getting the best results for our patients. Our receptionists will try to accommodate your busy schedule by finding appointments that suit your needs. We will help you understand your insurance coverage and if financial arrangements are necessary, we will be glad to help you develop a plan to make your vision care treatment possible. Aura is our billing specialist. She is happy to help with all your billing questions and needs. 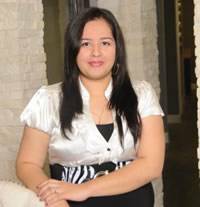 Aura is very knowledgeable about all insurance plans and is also bilingual. Aura has completed her training as a Medical Billing and Coding Specialist. Aura is married and has 3 beautiful children. TSO Katy Ranch Located at 24441 Katy Freeway ste 300, Katy, 77494, TX , . Phone: 281-392-4010. http://www.tsokatyranch.com/.